Many cities are turning to speed cameras for a quick solution to stop speeders. It seems like a foolproof solution. But can technology make mistakes? You may be surprised by the answer. Daniel Doty, a lawyer in Baltimore, MD, recently received a citation for speeding at 38 mph in a 25 mph zone. The citation included photos and a link to a 3 second video, both of which show that his Mazda was actually sitting still at a red light. Mr. Doty is contesting the $40 charge, but the repercussions are staggering. 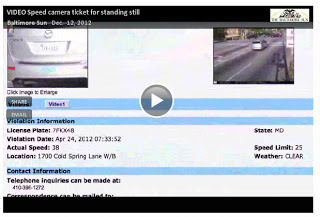 Thousands of speed tickets are issued each day. How many of them are mistakes? Apparently speed cameras, thought to be infallible, are capable of errors. But when they do work, do they really work? Do they create changes in driver behavior? more safely on roads not outfitted with cameras. One organization in the UK claims that speed cameras actually do cause worse driver behavior. Is there a better way to slow drivers for the long run? Unlike speed cameras, speed display signs simply alert drivers without penalizing them, trusting them to respond appropriately to the reminder. Speed signs create self-motivation and promote alertness that stays with drivers as they continue on new roads. Radar signs provide accurate speeds and effective, long-term speed control. Do speed cameras? PreviousPrevious post:Keeping ScoreNextNext post:Do you Plan to Stay Safe this Holiday Season?